The names and stories of the men and women who were primary caregivers to thoroughbreds, whether great champions or hard-working horses who ran on local racetracks, are largely unknown. Since many of these people were perceived as menial workers employed in the stables of the wealthy, they were overlooked by turf writers and the general public. However, even though fragmentary, a few stories of thoroughbreds and the men who loved them have come down to us from the past. One such narrative fragment concerns Will Harbut and the legendary Man O’ War. The Latin “texere” from which the word “text” derives means texture and was first used to describe the process of weaving textiles. There is a kind of lovely rapport between the concept of storytelling and weaving. Both involve the choice of a pattern, colour and intricate stitchery that produces a design. And both are human endeavours that seek to warm, beautify and inspire. It is in that spirit that we offer you another narrative of Will and his big, copper-red stallion. Will Harbut and Man O’ War. Photo by J.C. “Skeets” Meadors. Keeneland Library. 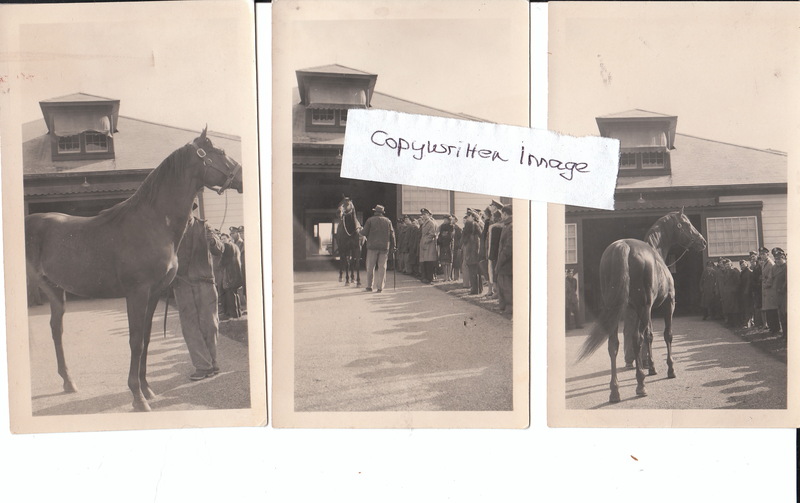 As frequent readers of THE VAULT know, I have long been a collector of old thoroughbred photographs. Many years ago now, I found this image of Will and Man O’ War. Unlike the version of the Meadors photo above, the one I purchased has a ‘whited out” background, so that only man, horse and a portion of the ground they walk upon are depicted. What transfixed me about the “revised” rendering of the famous Meadors photo is that Man O’ War and the man he loved have been pulled out of time. There is no car or other visual cue to bind them to a specific time or place. Will and Man O’ War appear deep in communion and their intimacy fills the eye. Will Harbut was born in 1885 and as a young man, moved to Maddoxtown, where he built one of its first houses on the land he purchased. 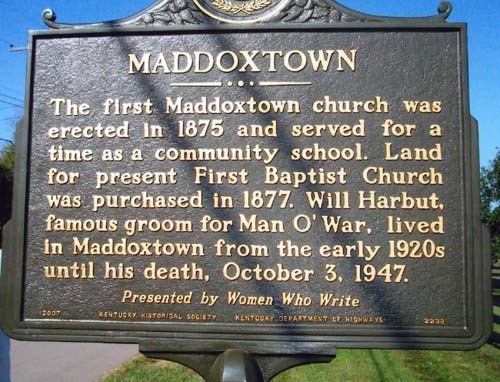 Maddoxtown was one of many “free towns” that sprung up in Kentucky after the Civil War where freed men and women could settle, farm and raise their families. The South of the pre-Civil War was a place where landowners and slaves contributed to a thriving economy. As we understand today, the master-slave relationship was a very complex one and, with the emancipation, was forced into a state of social upheaval that saw newly-liberated men, women and children leaving homesteads and flocking into Southern cities. And just as suddenly, these families found themselves homeless and jobless. In an attempt to restore social and economic order, the state of Kentucky opened free towns to Afro-Americans as a means of attracting them to rural areas where they would find some measure of security and employment. The other side of the plaque makes reference to Will Harbut, one of Maddoxtown’s founding fathers. 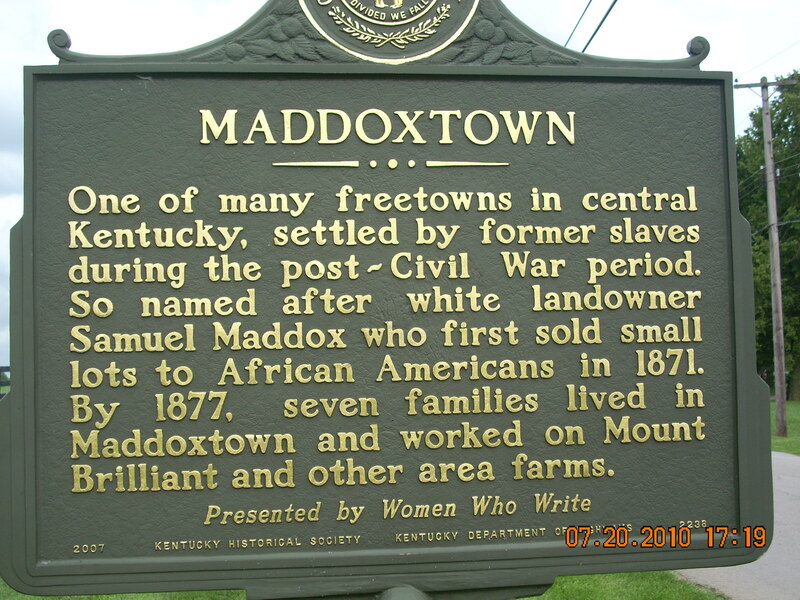 The residents of Maddoxtown farmed their land, while also working on the horse farms of the Bluegrass. As such, they were simply continuing a tradition of long-standing, since Afro-American men had cared for and ridden Kentucky thoroughbreds in the pre-Civil War era. Their contribution to thoroughbred history had been vital and important: 12 of the 15 jockeys who rode in the very first Kentucky Derby were Afro-Americans and thoroughbreds carrying Afro-American riders would wear the roses 15 times over the next 28 years. Men from the free towns around Lexington also served as trainers, as well as grooms, passing on their thoroughbred expertise from father-to-son. Will Harbut’s Maddoxtown home, where he and his wife, Mary, raised their 12 children, faces out onto the rolling pastures of the world’s thoroughbred heartland. On any given morning, Will could stand on his porch and watch bands of thoroughbreds grazing and rollicking in the lush bluegrass. By the time he was hired by farm manager Harry/Harrie B. Scott, Will Harbut had already gotten the reputation for being a fine horseman and, some said, a horse whisperer. And when Scott was asked to run the operations at Faraway Farm in 1930, he took Will with him. Photographer C.C. Cook’s shot of Man O’ War during his racing career. Man O’ War had been at stud for over a decade when Will Harbut walked into his life. His stud career had started off at Elizabeth Daingerfield’s Hinata Farm, outside Lexington. Daingerfield was a consummate horsewoman and an expert breeder. She went on to purchase and set up Faraway Farm for Riddle and served as its manager until 1930, when Scott took over. So it was that Will became Man O’ War’s new stud groom and the two would be together, each and every day, for more than 15 years. Will had never seen Man O’ War race, but at the time he became the stallion’s handler he certainly knew he was rubbing a living legend. Did Will also know that he had just met his soul mate, a thoroughbred who would make Will his (equine) family? Perhaps not in that first meeting, but I would wager that it wasn’t long before both horse and man knew that they had found the truest expression of themselves in the light of the other’s eye. Man O’ War was the kind of thoroughbred that brought you closer to divinity than most people had ever been before. Man O’ War probably found his life as a breeding stallion far more satisfactory than he did the highly structured and controlled life of a race horse. Intelligent and high strung by nature, life on the farm offered Big Red great distractions, as well as time to churn up his paddock on a regular basis, kicking up sod as though he were being chased by a predator. For his part, Will Harbut provided a firm and loving hand and a routine that made Big Red feel secure and happy within himself. The man who had broken more thoroughbreds than he could count and who owned not one, but two teams of draft horses understood the equine soul. And, as a father of 12, there was probably little Man O’ War could do that would surprise him. Having a best friend like Will Harbut also assured the champion some privacy and respect. Samuel Riddle was most generous in allowing fans access to Man O’ War, for Faraway Farm was open to visitors every day from 9 a.m. – 4 p.m. Although he greeted over a million visitors, Will refused to wake the stallion up if visitors arrived when the horse was napping, telling them rather curtly, ” When Man O’ War wants to get up, he get up. And when he wants to lie down, he lie down.” If it was time for Man O’ War to be fed, Will would shoo people away and ask them to wait. If the stallion was out in his paddock and if Red appeared to be inviting company, Will might take one or two people right up to him. Although dignitaries from all walks of life, including film star Jeanette MacDonald, Henry M. Leland (founder of Cadillac Co.), Lord Halifax and government officials visited on a regular basis, Will never distinguished between famous and average folks. Everyone was treated with the same respect and everyone was made to understand that the only dignitary at Faraway was Man O’ War himself and, as time went on, his sons. 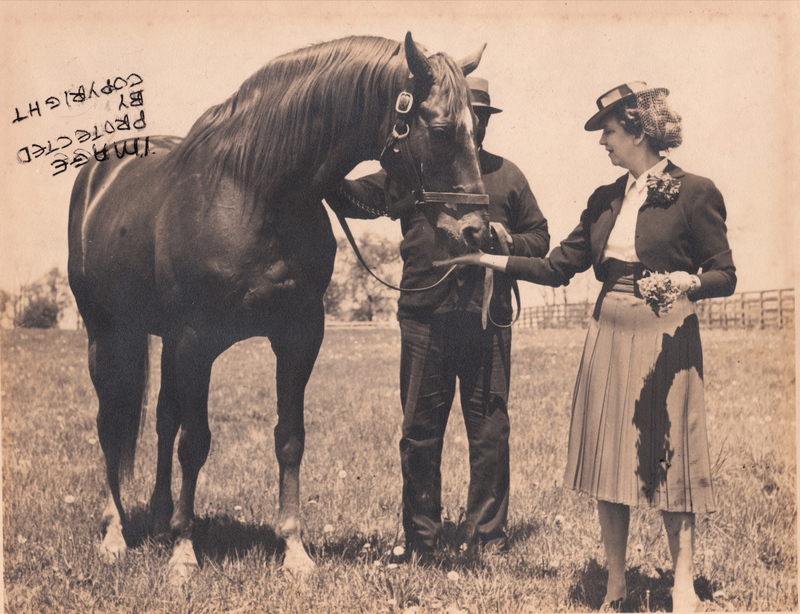 A typical day for Will and Man O’ War involved visits with fans. These three tiny photos were taken by a fan, name unknown. They were discovered on eBay under the heading “Man, horse & barn” !!!! A lovely shot of Man O’ War accepting a treat from an unidentified woman. Will stands next to his big red horse, his hand resting, reassuringly, on Man O’ War’s neck. It was during these public visits that Will became famous for giving Man O’ War a voice. When visitors arrived, they first received a tour of Faraway Farm and some of its other equine superstars and, when anticipation had mounted enough to make even the hardiest mouth go dry, Will would disappear into the small barn to emerge with Red. As men and women gaped, Man O’ War struck what was to become an archetypal pose — head held high, muscles rippling under his copper coat, feet firmly planted and eyes that looked away, towards the horizon. Even when posing in his paddock, Man O’ War had the stance of a thoroughbred legend. Photographer unknown. If he judged his audience worthy, Will would tell them a story or two. To be thus acknowledged, Will needed to feel that his visitors were in awe of the champion. Otherwise, he led the stallion out, waited a bit and then led him back to his stall. But whether or not Will so acknowledged you, a visit with Man O’ War always began with, “Folks, this is Man O’ War. He’s the greatest horse that ever lived. He’s the most and he’s going to go on being the most as long as you and I can tell about it.” Although he was famous for his declaration that Man O’ War was “… just the mostest horse,” Will spun a whole anthology of tales for his rapt listeners, holding the mighty stallion on a loose shank with one hand. His stories were never exactly the same and when he was storying, Will talked as much to Red as he did to his admirers. And Red always listened, punctuating the anecdotes with nods, nickers or snorts. In most of the popular photos of Will and Man O’ War, the two are posing. 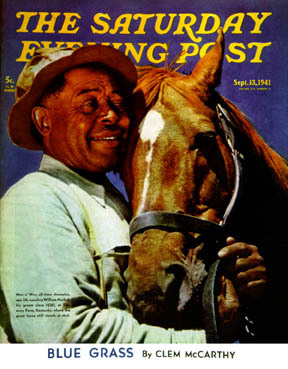 But what was lovely about the shots taken in 1941 by Ivan Dmitri for the cover of The Saturday Evening Post (below) was the way they articulated Will and his horse ….. or, Man O’ War with his Will. ….and the one that did! The famous cover shot would also inspire equine artist, Fred Stone, whose collectors’ plate, “Forever Friends” remains one of his most popular. Had they seen Stone’s plate, neither Will nor Man O’ War would have been surprised. The most famous photographers, artists and sculptors of the day immortalized the champion, who stood for sittings patiently because Will was almost always at his side. Although dated 1947, this photograph was taken some time before May 1, 1946 when Will suffered the stroke that would leave him blind and frail. It may well be one of the last photos ever taken of Man O’ War and his best friend in all the world, Will Harbut. Will Harbut died on October 3, 1947. His obituary in The Blood Horse listed among his survivors his wife, six sons, three daughters and Man O’ War. 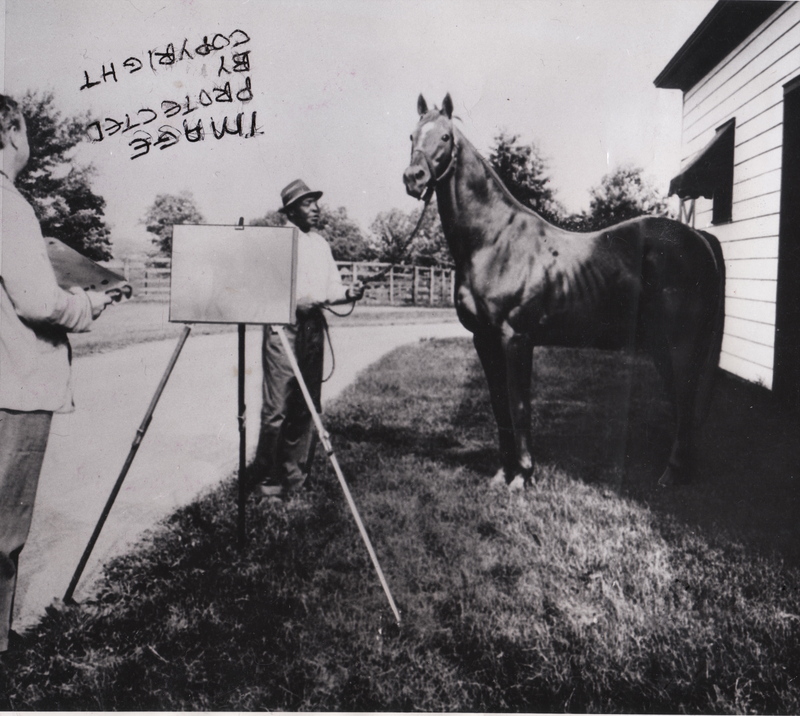 Less than a month later, as photographer James W. Sames recounted to The Blood-Horse, he visited Faraway Farm at the request of farm manager, Patrick O’Neill, to take some pictures of Man O’ War. Little did he know that the last photo he took, in colour, would be the final image of a legend. When his new groom, Cunningham Graves, affectionately known as Bub, took Man O’ War back to his stall, the stallion balked. His head held high, he looked out and down the driveway, perhaps searching for a familiar figure. Finally, Man O’ War entered his stall at Faraway Farm and lay down. Postscript: Man O’ War died on November 1, 1947. Given the thousands who wished to pay their final respects, he was laid out in his coffin before being buried at Faraway Farm. When Man O’ War’s remains were disinterred and re-settled at the Kentucky Horse Park, the Harbut family declined a request to move Will Harbut from his burial spot, in the Maddoxtown cemetery, to a grave near the Man O’ War memorial. Instead, a plaque was erected beside the statue that tells the story of their long and loving relationship. TO SEE SOME WONDERFUL, RARE PHOTOS OF MAN O’ WAR, READERS SHOULD VISIT THE KENTUCKIANA ONLINE DIGITAL LIBRARY. 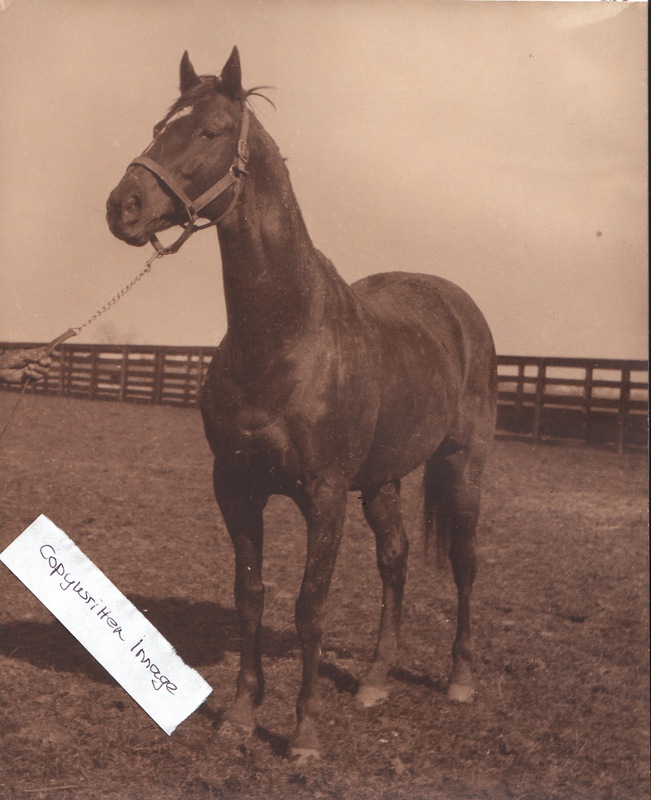 Here are a few links to some of the photos of Man O’ War and Will (below). 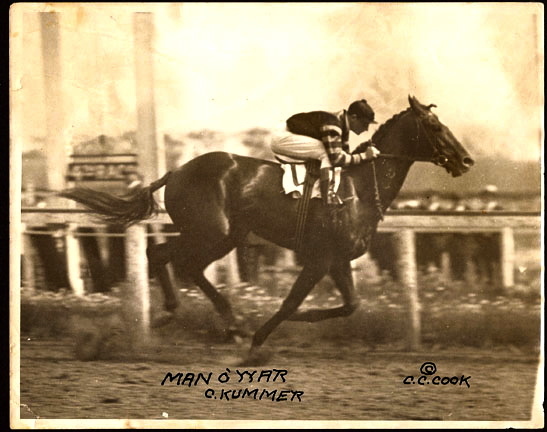 To SEARCH the collection, go to this address http://kdl.kyvl.org/ AND type Man O’ War into the BOX above SEARCH ALL COLLECTIONS. Abigiail, what a beautiful, tear producing story. Even though Will came to Big Red a little later Big Red’s life they bonded very quickly and became as one. I find it particularly significant that Big Red survived his best friend by less than one month, almost as if he didn’t want to carry on without his significant other. His memorial at the Horse Park is a tribute to both horse and groom even though Mr. Harbut is resting in his home town. I can hardly wait for the next chapter, Secretariat and Mr. Sweat. I will, however, contain myself and admire a small print of the Nick Martinez painting of himself winning the Belmont that I treated myself to this past weekend at Saratoga. Congratulations Abigail on another fine piece of work. This is a really late response, but can’t you love this article without being a typical Secretariat fan and get your two cents in about him and Sweat?????? THIS is WHY I felt the need to respond to irritating people that can’t let Man O’ War have his time. Yes I agree, we DO need to love and respect ALL of these great beautiful noble animals. However; I think Man O’ War fans ARE respectful, and the other red horses’s fans are not. But, we are all entitled to our opinions but if they were not so nasty and rude, etc. etc. etc. and always having to get their 2 cents in etc. etc. etc. (I’m good at etc’s LOL) then maybe there wouldn’t be all the instances that, otherwise, in MY opinion, are unnecessary. I could elaborate but why. I think we are all so passionate about our favorites but I’ve never associated with fans of other horses that were so vicious. Thanks. Absolutely beautifully written. You captured the bond between Man and Horse perfectly. Loved it. Hugs, J.B.
My late mare was also a descendant of the great Man O War. She was amazing and so much fun, and I will forever miss her. What a beautiful story about the bond between man and horse. Also sad, I can imagine Big Red died of a broken heart. I like think they’re kicking up clouds together in heaven. Abigail- I LOVED this article so much! I have had a fascination with Man O’ War since I was a child and I have always loved the stories about him and Will Harbut. Horses form such strong relationships, whether with other horses or humans and that is a topic that especially interests me. I could go on and on (but won’t! )-but thank you for this! You write so well- thank you for sharing your gift. P.S. One of our horses is related to Man O’War. We were farm-sitting 14 years ago and assisted with a foaling. The mare was 25. Her colt had a rough time and a few months later, we were farm-sitting again while he had pneumonia and severe diarrhea. We nursed him thru that and the owner offered him to us-he was too puny, they thought. We took him and, much to our surprise, found out that the mare was a granddaughter of War Admiral! She was the spitting-image of him (female version) and, so, resembled Man O’War! He is now a solid, healthy 15.2hh gelding who is so dear to us and terribly devoted. I told my daughter that if I had known as a child that some day I would own a horse related to Big Red AND the Godolphin Arabian(Barb), that I would have run screaming into traffic- and we didn’t even HAVE traffic! Forgive me for adding this personal story but I thought you could appreciate how I feel. Thanks again! This is one beautiful article! I agree with Brenda, I was sniffing. As ever you done real good. Also impatient re Secretariat. LIZ: Thanks so much. Secretariat & Eddie are next. They will be a much easier task, thanks to Ray Woolfe’s book & the one by Lawrence Scanlon, that is just incredible. HUGS! This is so beautiful. Wish all horses had someone to LOVE.AND YES, horses can feel love. When I set out to become, if possible, a groom many years ago I also set out to be as much like Will Harbut as anyone could. I never succeeded, but did and do still aspire to his greatness, humility, genius and love of a horse. GRANNY J: HOW GREAT TO HEAR FROM YOU!!! I’M SO GLAD TOO THAT YOU LIKED THIS ARTICLE…..IT TOOK ALMOST 5 YEARS TO LOCATE ENOUGH INFO. TO WRITE IT. I’m sorry I left a personal story on your comment space. SUSAN: That’s what the comment space is for! Always GREAT to hear from you. Thank you so much for taking the time to respond. I do this for readers like you & always enjoy hearing your reactions. Loved the story. Wanted you to know that the groom leading Man O’ War in the video was John Buckner “Buck” who worked for my great aunt, Elizabeth Daingerfield. It was always said in my family that Man O’ War preferred Buck to Will Harbut. Also, my mother always claimed that she got to sit on Man O’ War when she was a little girl while on one of her many visits to Lexington. Keep up the good work! When Big Red raised his head to stare down the drive refusing to move, was Will waiting for him, beckoning him, telling him it was his time to join him when they would be together for always. Lynda: Yes, that’s EXACTLY how I see it, too. And each and every time I think about it, I am reminded of the deep bond Will & his big red horse shared. It must have been amazing to actually meet them together. Roz: Thank you so much! I’m thrilled that so many people enjoyed their story — it took me about 5 years to do the research to write it! all those offspring of his that are buried there. One can hardly find the place last time I looked. O War several times. I have a lot of memories of that lovely location. Hi, Was just reading this site. You actually saw Man O ‘War in person, wow are you lucky. I have been trying everywhere to own something that actually belonged to him. He’s my favorite and I think that he is the greatest. But, since you saw him in person, do you mind if I ask you if you saw Count Fleet race and how would you rate him alongside Citation and Secretariat? I think it would be so wonderful to have seen all the great horses race, but especially my hero, Man O’ War. Thanks, Lorraine PS, I think Whirlaway and Spectacular Bid need an honorable mention!! Good morning lorraine, I was just a youngster when Man O War died. As I said I was born in 41 on my grandfathers farm across the road from Far Away farm, the other big farm that was across the road from our home and madduxtown was Mt Brilliant. Mt brilliant was a stock farm. The grave of Domino was also near my grandfathers home. have you ever heard of Domino? On his marker it reads, here lies the fleetest runner the american turf has ever known, and one of the gamest and most generous of horses. I did not go to the horse races when i was a youngster, I went to races later in life and still go to keenland from time to time when I go back to Kentucky. Man O War is my favorite as well. Of course the reason is when I was a child living near him and the other great farms and horses of that beautiful area. This is a neat site to talk about such things that one grew up with, I am a very lucky person. Excellent article, I have loved Big Red since I was a child. You can still see the flame in his eyes and the love between he and his groom. Together, they were the “mostest”. Terrie: Thanks so much for taking the time to write. They were absolutely a great partnership. Thank you so much for this wonderful and informative work. I can never get enough of Man o’ War. The pictures and links are also greatly appreciated. I remember telling my grandmother, who came to Texas from Kentucky as a young girl, that Secretariat was the greatest race horse there would ever be. She advised me in no uncertain terms that the greatest race horse was Man o’ War and that I’d better brush up on my horse history. I did, and have loved the big red horse ever since. 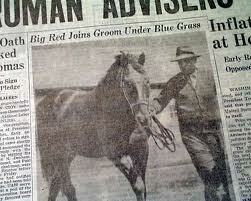 Some years ago there was an article in the Old Farmer’s Almanac about Big Red and Will Harbut. I have no idea who wrote it, but it was an outstanding article. Thank you for providing photos and more information! Dinah: Thank you so much for taking the time to write. I so appreciate hearing from VAULT readers — it makes the research & the writing very rewarding. I would love to have seen that Old Farmer’s Almanac edition as information on Will and his big red horse is very, very scarce to come by! God bless your grandmother. I don’t know who she is but she has answered the long fought question. Thank you from a Man O’ War fan SO sick of Secretariat fans!!! Lorraine: Man O’ War was just an absolutely WONDERFUL horse. I have a few photos of him with Will and one sits proud in the living room. Both of my grandparents loved the thoroughbred and oh my! the stories they would tell. It was a huge part of my childhood — a treasured memory. And they would be proud to know that they had a hand in bringing THE VAULT into being. Thank you so much for taking the time to write. It’s deeply appreciated!!!! We found this wonderful article a while after you wrote it. It is fabulous. We were researching the timeless “washed-out” photo that we have, which sounds to be the same as the one you have. Ours was found when my now-deceased father was remodeling a cabin he bought in Blue Mountain, Arkansas. The cabin was built in the 1930s and he bought it in 1982. As soon as he took ownership he started tearing down the old interior walls and he found the photo rolled up with a blue ribbon around it. He called me and said he was sending it to me since we are horse owners. Our photo has “Skeets Meador” embossed in the lower left corner. We thought it may be of some value so we had it archive mounted and it still hangs in our hallway next to an old photo of Robert E. Lee and Traveler. If you have any info on why the photo would be embossed, please let me know. Thanks again for telling us about Will and Big Red. Connie: I agree with your observation about testing the remains. What I don’t know is which of the other Riddle horses were also moved, with the exception of War Admiral, whose final resting place is next to his sire at the Kentucky Horse Park. However, there is a book called “Etched In Stone” by Lucy Zeh that might be helpful in this regard. Thank you for taking the time to write. I really appreciate it! I was wrong when I said that the old gravesite was on the right as you head towards the barn, it is on the left with the pin oak trees around the area. I talk to Will’s son Tom from time to time as my cousin George lives down the road from where Tom lives in Will’s old home. George is a friend of Tom Harbut, George was raised on the other side of Lexington. I will call in the next couple of days to wish Tom an merry christmas and a safe and healthy new year. The same to all of you, Merry Christmas. Thank you Robert for your story and imformation. And dear Abigail thank you for all the research and lovely articles. I so look forward to them. Happy Holidays and God Bless. Thank you so much for taking the time to comment. Hearing back from my readers means a great deal to me! Great article…but some of the comments take my breath away! How awe-inspiring would it be to interview someone who saw Man O’ War – and who remembers the farm the way it used to be? Just as amazing would be to talk to Tom Harbut. I wonder if his children are interested in their father and grandfather’s rich history? Hi, I actually FB’d Tom Harbut and he was really nice to answer me, but unfortunately, I didn’t get to ask him about his dad or his association with Man O’ War. It sure would be nice if people that saw Man O’ War were still around. I think his name is fading, every horse that has come along has allegedly been greater and they didn’t “stick” except one, and that name is getting old. Just thought I’d let you know about my short emails with Tom Harbut. Good morning, I will call Tom today to get his e-mail. I was not aware that he was on the computer. He knew my father and i am going to send him some photos of my family. I have the Meadors picture – the whited out version – purchased at a pawn shop in 1970 when I was a new Orlando Sentinel copykid, and college kid, who had $10 left after buying groceries and paying rent. Curious about pawn shops, I went into one on my way home, saw the picture, knew who it was like I’d recognize my own folks. How much? “$10,” and the man knew it was Man o’War, nothing about its history. Poster-sized beautiful framed photo I’ve carried around everywhere I’ve lived. When I was 7, I’d tell my Texas friends MY horse would be a jumper, dressage horse, mannerly, would love me so much no one could ride him but me, and he had to be kin to Man o’War. They laughed – this was cow horse country. But 11 years after picking up that photograph, I acquired a 17-year-old Thoroughbred who had been starved and neglected, and I brought him back. Took me a year to get his documents from The Jockey Club. But when I opened the paperwork’s envelope, I began screaming…he was the son of War Jeep, son of War Admiral. The last piece of the puzzle was found. And when I went to Pimlico, and saw its blow-up picture of “granddad,” I realized that my beloved Stradivarius was the spitting image of War Admiral. I have Mr. Stone’s plate, too, and when I see those images, I see two dear friends. In the picture, they’re walking in step. The lead is loose – it’s just a formality. 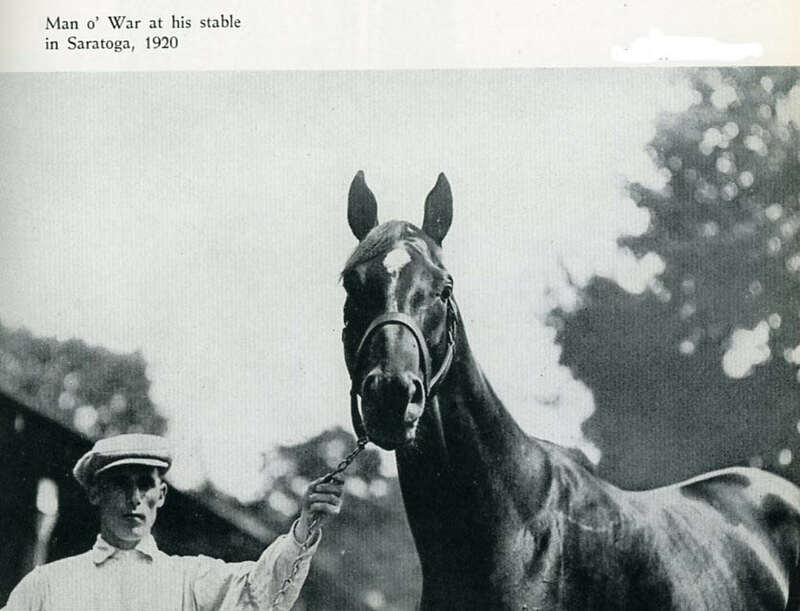 I have agreed since I first read about Man o’War with Mr. Harbutt’s evaluation – he was the mostest horse. And while Strad died at 29, he’s buried on my land in Florida. DONNA BETH: I so enjoyed hearing from you and reading your story about the Meadors’ photo and Stradivarius. And I can so relate to other details here as well. Like you, I have been a “horse nut” all of my life, with a particular passion for the thoroughbred. My grandfather was the same and he would tell me the most amazing stories about Man O’ War, War Admiral, Count Fleet, Gallant Fox, Seabiscuit and others. It was many years later before I realized that Grandpa’s stories had come largely from the radio because when he’d tell them, it was just as though Will and his big horse were standing right there in the room beside us. Like you, I eeked out a few dollars here and there to buy thoroughbred memorabilia and books. My Meadors photo came later. I actually found it on EBAY in the early years (when you could still find great photos at reasonable prices). It had turned up at an auction in Florida. When the photo arrived, it turned out to be signed by Colonel Bradley, one of racing’s more prominent figures in Big Red’s day. I actually sought out his nephew, who confirmed that it was indeed the Colonel’s writing. So I was thrilled with that aspect of the photo,too. I then discovered — as I’m sure you must know — that the original had a car and other details in the background that Meadors blotted out in this version, which I personally like better. It reminds me of Tony Leonard’s famous portrait of Secretariat At The Belmont, where he did something similar. I have always been interested in the “real” people in these horse’s lives, although because of the history of the sport, most of their stories are lost to us today. It took me about 8 years to locate enough information about Will to write this piece and I am so proud of it. I wrote it from the heart for Big Red and his best friend, Will. Wow, your uncle got to see Man O’ War in person, wow. I wish like anything I could have a strand of his mane or something that touched this greatest ever horse, but unfortunately not. At 57 years of age, I’m hoping that I will get to see him run when I “pass over”. Such a nice comment and it is SO nice to see people still LOVE and respect the original Big Red! Abigail and Lorraine- Thank you both for your comments. I have a question. Are we allowed to post pictures here? I was going to show you the picture my uncle took. Abigail- I’m sure someone has posted this link in the past, but I just ran across it. It is the radio broadcast of the 26 minute funeral along with a lot of good video of the great horse. It’s well worth the 26 minutes, but don’t watch it without plenty of Kleenex. I made it pretty well until they played “Taps” at the end and I lost it. No need to apologize for the delay. Mums are hard to come by. First things first and she is first. Gonna send some prayers just like Marlaine is. Dear Abigail,So sorry to hear about your Mom. You take care of her and yourself.We can manage without your most enlightening,beautiful,captivating,heartwarming,and informative stories. Well for a little while anyway. Take care and prayers going out for your family. Harrie Scott must be dead? He recently came up in relationship to a braid of Man O’ War’s mane that I would give anything to own a snipit of. PS, since it is in 2014, sorry about your mom, she must have passed? I know how it feels, my mom passed in 1993 and it’s still hard sometimes, it gets easier but never better. And, one more thing, for Secretariat fans that can’t stand to give Man O’ War his time without their 2 cents, what horses will you write stories on? Personally I think Man O’ War is the greatest and think his story was more important to tell since he was over 90 years ago, whereas, there is SO much on Secretariat, with special mention of Secretariat.com. Wow, thanks Abigail!! I shall enjoy reading the article! Hello all, This is Bob Fister. I was in Lexington to visit my sister in june and while I was in Lexington I went out to the old home place where I was born on the Huffman Mill road, That is where Man O War was stabled until he died and also where he was put to rest in 1947. I stopped in to see Tom Harbut in Madduxtown, he is the son of will Harbut. He is doing fairly well, One of his sons lives with him now a days, I found Wills grandson to be a very proper and nice young man. I had a very nice visit with Tom while I was there, He does not drive any more as he is getting on of age. I stood on his front porch and looked out across the land and could see the little house that now stands on the land where I was born, it is about a quarter of a mile from Tom’s home. Tom lives in the same house that Was built by his father Will Harbut. It was a great visit with Tom but a sad visit for me as my sister passed away while I was there, I did get to visit her several times before she passed on. That part of the country is so pretty this time of year. In closing this little message I still smile when I read these posts from time to time, time changes every thing for sure. Out of seven children I am the last. I hope to return to Lexington to visit from time to time, It will not be the same in the future but I do have these very fond memories of the place where I was born and lived for eight years before moving on to Bourbon Co Ky. The farm just turned 240 years old, it was surveyed 240 years ago, It was part of a 2000 acre land grant that was given to Alexander Spotswood Dandridge I believe his father received it as he was a high ranking officer and they were given large plots of land. What I am getting at is the Dandridge family included Martha Custis Washington and Patrick Henry. So it is only right that Man O War would be laid to rest on historical such land. 1874 to 2014, 240 years. History was all around us. Man O War, the greatest horse! Thanks for all of these great posts. Robert, my name is Lorraine and I’m a hugh (well, figuratively) Man O’ War fan. I just think this horse is the greatest and I believe that Man O’ War fans are TOO passive nowadays. It seems like no one wants to remember Man O’ War or what he did and it’s really ashame. I love this horse more than life itself. And, so when I see someone think or write saying how this horse is the greatest it just melts my heart. I really enjoyed your story A LOT. Even though I’m sort of on the “old” side, all my life I wished I could get a hold of just a snipit of Man O’ War’s mane, can you imagine owning that, wow. Heritage Auctions has Man O’ War’s mane on auction and it kills me that I can’t afford to buy it. I asked them for a snipit if they could contact the owner but it was no use. ANYWAY, I have contacted relatives of the connections of this greatest of all horses and everyone has been so nice to return my emails or messages on Facebook. I have a few emails from different relatives, such as Louis Feustel’s niece (I believe although I haven’t re read her letter in awhile) and I have one from Greg Harbut. He seems like such a nice guy and was truly nice to email me back. And, because he is WIll’s grandson, I treasure his message back to me. It’s amazing how nice the families of the connections of Man O’ War are. Of course I still don’t have a shoe or strand of mane but I really enjoy getting messages from connections. IF they only knew my love for this horse. I wish Man O’ War fans were not so passive. I wish we had festivals and movies etc etc etc, you know what I’m saying?! Anyway, to all that love Man O’ War and RESPECT this horse and what he did in 1919 and 1920, then I forever am grateful. Thanks everyone for your stories, it’s just so nice we have this forum in which to share our stories or memories and remember, who?, THE GREATEST HORSE, MAN O’ WAR!!!!!!!!!!!!!!!!! Hi Abigail, I just finished your story about YOUR HOST.It touched my heart for several reasons. My Mother Helene Haggerty owned a horse named Rampart who was bred to Your Host . My Mother was a friend of Mr.and Mrs. F.Wallis Armstrong who owned Meadow View Farm in Moorestown,NJ. I would like to know more about the history of the farm and from the comments there must be some people who have that info and since I now live in N.J. and have seen the houses that were built on that ground. P.S, Rampart is a granddaughter of Man O War and she lived out her years at my brother’s farm in Norwell Massachusetts. Confined by a snow storm here in Texas and who comes to mind?… Will Harbut for unknown reasons. A search leads to another fabulously detailed and moving story by Abigail written in 2011. It is a timeless story as it illustrates the forever bond of man to equine. I invite all readers to search the comments and read the tributes, view the pictures and A/V of Man O Wars funeral. We must not ever forget our history and where it has brought us. Man O War and Will Harbut still live among us. Thank you Abigail for making them part of our lives to this day. Thanks Buddy….I did just that last night. My favorite all time horse is Whirlaway who was popular around the time of Man O War’s famous Saturday Evening Post cover with Will. Thanks for all your info. A great link to the past. Wow, Buddy, you got to see Man O’ War in person, wow. Even though he raced before your time, It’s always fascinating to me the people that have seen ALL the greats. I LOVE Man O’ War and wish I could find someone that would donate a snipit of his mane or tail to an old lady who LOVES this horse more than life itself. But, anyway, I have heard the radio broadcast of his funeral and am taken that there IS a reason Man O’ War is the greatest and what HE did for Kentucky is unbelievable. NO horse has ever gotten this kind of tribute in their passing. Too bad his name and fans seem to be dwindling, it’s this “2nd half of the Century” bull. Anyway, would love to see the picture. Can you post it? Also, I created a page called Man O’ War, The Greatest, check it out!!! The bad part about seeing Man O War is that I didn’t remember it. He died when I was 8 years old. My uncle had a photography studio in Lexington where I was born and lived til I was 8. Years later my uncle passed away and my aunt sent me the picture and wanted me to have it since my uncle took me with him the day he took the picture.I don’t know how old I was when he took it but I didn’t remember it. I just took my aunts word for it. But since that was 3/4 of a century ago, there are many things I don’t remember………. Just the fact you shared the same air space is really cool for me. You were in his presence. I obviously got something from him by osmosis. My ex wives all say I am a horses a.. Exactly Marlaine. I could say some things about that 3/4 of a Century ago, but I’ll be nice. However; with your comment, “to be in HIS (I capitalized it) presence” you get “it”. That’s probably one of the reasons I’m thinking about crossing the Country to go to the Kentucky Horse Park to be in HIS presence, even though it is just Man O’ War’s grave, but wow, to be THAT close to this great horse. I hope it will touch me the way I think it will. I have a feeling that I may lose it and have a hard time controlling my emotions!!!! lol. I have not seen on these posts about Tom Harbut’s passing away this past summer. He was a very nice man and he will be missed by me, his family and his many friends. I believe that Tom was 94. When I would visit with him from time to time he would tell me stories about my father Herb Fister and my grandfather Fred Fister. I was told stories that I had never heard before. I so much enjoyed the little time that I spent around this man, I do not have many reasons to return to the home place. RIP Tom, You will be remembered! Me and my fiance read this story today and it was a def heart warmer and tear jerker. It was amazing how close Will and Man o War were so close that a horse grieved himself to death not even 30 days after his owner. So sad!! We have found in my grandmothers things that she left to us, an original authenic autographed picture of Man o War with Will. This picture is an original and has worth and we would like it to be in the hands of people who would appreciate it and its worth. Please send reply and value. Thank you. I would donate if I could use Paypal. If you decide to add it, let me know and I’ll come back and donate. Your site was very helpful in my research on Man O’ War for a graphic design project. Thanks! Thanks for this on the remarkable life and accomplishments of Mr. Harbut. My grandfather, Joseph Bryan Martin, was MOW’s first trainer and first to ride the great horse. He is shown with MOW in the earliest known existing photo of the horse. I have a photo of my mother taken by Skeets Meadors at her desk in the office of Calumet, probably in 1947. I can’t tell you much about it. MOW was obviously a weanling. I always wondered about that photo if it really was Man O’ War. There are so many photos out there and it’s sad, but people don’t realize they are NOT the great horse. You can’t really see his markings. Also, you wouldn’t be the owner of Man O’ War’s mane, would you? Someone bought it from Heritage Auctions and I’d love to find out who. Anyway, I could talk about this greatest ever horse all day. I’ve seen his memorabilia go for thousands and that’s not fair to those of us who love this horse more than life itself and don’t have the bank account lol!!! Anyway, I saw your post and just had to respond. It must be awesome to be connected to someone who was connected with Man O’ War. Charlene, the photo is no longer covered by copyright, so you can put a copy on your wall for the cost of a print and a frame. And you know something about it that the owner of the original may not. 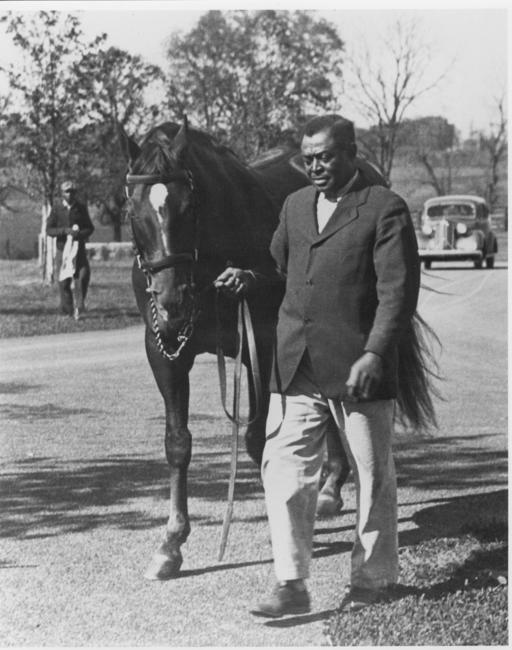 When my grandfather talked with me about his time with MOW, the horse was revered by some, but celebrity culture had not blossomed, and he had no idea that the image, and interest in MOW, would live in perpetuity. It was just a good distant memory for him and a picture on his wall. A few years back I photographed my daughter, Bryan Martin’s great-granddaughter, in front on Man o’ War’s famous statue, which I had printed as a poster and also value greatly.